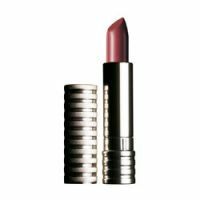 Love This in "Silvery Moon," "All Heart," "Pink Chocolate"
A friend and I rather to each other about this lipstick. It lasts longer than expected, especially when worn over a good primer. The feel is silky-soft. Lips are hydrated. The color doesn't feather or wander. Clinique is a high quality line of cosmetics. The matte lipstick keeps your lips moisturized and lasts. Good color selection, too. This is my one and only HG lipstick - the ONLY one I've ever wanted to repurchase and that I am currently hunting down like a woman obsessed. Correction, I am a woman obsessed. I've never used a lipstick all the way down to the casing. I'm 2 mm away from the end and I'm desperate to find another. For some reason I couldn't find it here in SG until today - and they were out of stock. Holy-how-frust...read morerating-is-that-batman! I love how the color is perfect for a muted red/berry that is so wearable for a daytime polished professional look. It brightens up my face without itself being too bright. I can't wear really bright lipsticks and so I have trouble finding shades that brighten up my skin without the lipstick looking garish. Neither can I wear the nudes well because I look like death. I'm therefore constantly on the hunt to find the *perfect* lipstick and this comes pretty close. The only other lipstick I might consider as a really suitable color for me is Stila's convertible in Rose. O btw, I love the soft matte, natural finish of the Clinique LL Berry Berry Matte. O for reference I am fair, of Chinese descent with some yellow undertone. I prefer colors close to neutral with a bigger preference for neutral-cool than neutral-warm. Anything too far cool or warm doesn't work on me. Edit: This is too hard to find. BUT Raspberry Rush in the Butter Shine formula gives me a similar look and is I love that! So guess i don't have to hunt for the elusive Berry Berry anymore! I did some research on good long-lasting lipsticks and decided to try Clinique's long last soft matte lipstick in berry berry. The first few days were okay, the color was good and it was easy to put on. It seemed to last a long time. However, for some reason, after a few days, it started to look like those bad never come off lipsticks and left a "lipstick ring" around my mouth. My lips are so dry. The packaging is nice and the color okay. I have been exfoliating my lips lately and that's seems to fix the drying effect I thought was due to the lipstick. So as of now, I actually love it.... the color is great and it does last a long time. Would buy again for sure. Smooth beautiful color. Goes on nice, stays where you put it. Makes my lips feel conditioned and soft. I like the idea of it - the color IS very pretty - it just doesn't look good with my skin tone. It's a very cool color, I would prefer something warmer. But otherwise, it's the perfect berry color. I would suggest wearing a chapstick or lipgloss with it, though, as it's very drying.